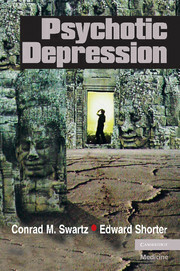 Psychotic depression / Conrad M. Swartz, Edward Shorter. 1. Psychotic depression. I. Shorter, Edward. II. Title. III. Series. Every effort has been made in preparing this book to provide accurate and up-to-date information that is in accord with accepted standards and practice at the time of publication. Nevertheless, the authors, editors, and publisher can make no warranties that the information contained herein is totally free from error, not least because clinical standards are constantly changing through research and regulation. The authors, editors, and publisher therefore disclaim all liability for direct or consequential damages resulting from the use of material contained in this book. Readers are strongly advised to pay careful attention to information provided by the manufacturer of any drugs or equipment that they plan to use. Cambridge University Press has no responsibility for the persistence or accuracy of URLs for external or third-party Internet Web sites referred to in this book, and does not guarantee that any content on such Web sites is, or will remain, accurate or appropriate.